"If We Protect What's Precious, We Protect the Preborn. Respect All Human Life." 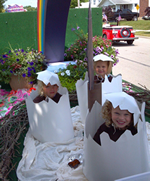 This was the message greeting parade watchers at the Botkins Carousel, Versailles Poultry Days, and Anna Homecoming, courtesy of the Right to Life float. 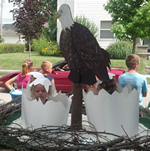 The float featured an eagle guarding its nest of newly hatched "eaglets"--pro-life kids sitting inside cracked eggs within a nest of branches. The float evoked our society's concern for wildlife, which is sometimes disproportionate to our lack of concern for human life such as the unprotected child in the womb. The float won first place in the Organizations category at Botkins, as well as the Senior Civic Award at Versailles. A big thank you to Jenni Bohman, Sanna and David Aikin, Alana and Zanthia Hill, Carol and Steve Dircksen, Gloria Schmiesing, and all those who helped with the float this year.